Andrea has written 9 article(s) for InMenlo. The first time I had spinach dip was in college and it was served in a large hollowed out bread bowl. It was not health food by any means, but I can admit it, the whole thing was delicious. But that was in the Midwest, I don’t see many bread bowls being served in Northern Cal. Dips (at least the good ones) are not typically healthful, but that’s ok, they are after all for “dipping” not “devouring.“ Parties are the perfect place for dips; quick to make, great for groups of any size and easy for guests to snack on (especially if they’re busy watching a game). 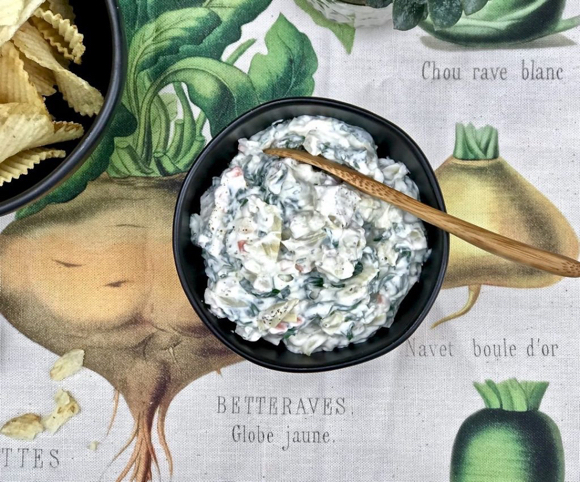 While I appreciate a great spinach dip, I’ve actually come to prefer a spinach-artichoke combo more, the blending of my two favorite dips into one is perfection. 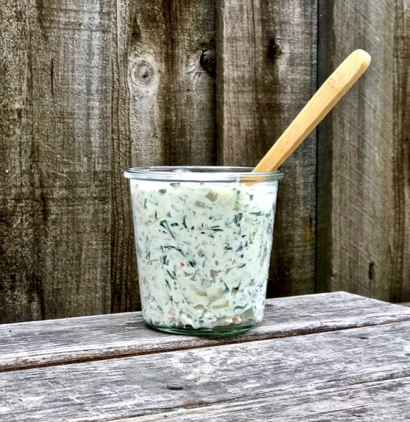 Not surprisingly, I recently learned this combination is one of the most searched dips online – I guess others like this duo as much as I do. The beauty of this simple dip is you don’t need a blender to make it. Rejoice, I don’t say that very often. This crowd-pleasing dip recipe is also packed with some extra veggies to balance the decadence of the dip base itself. Sour cream and mayonnaise make up the standard base in my recipe, but the fresh lemon juice brings out some nice tart flavor which also compliment the earthy artichokes nicely. The bonus, this dip is best when made ahead, this allows the favors to blend more. There are few ways you can cut the calorie in this recipe if that’s important to you. A low-fat sour cream can be used, just avoid the fat-free version that has lots of sugar and does not have as good of a texture. If you wish to avoid sour cream all together, you can also make it with a whole or low-fat greek yogurt without losing much flavor. While I don’t serve my spinach-artichoke dip in a bread bowl, I respect that many do. So, if you’re looking for tips on how to make a beautiful edible bread bowl, check out this link to learn how. Bread bowl aside, this is a great, easy, go-to party dip that works equally well with chips or veggies alike. Step 1: Place a medium sauté pan over medium-high heat. Add the oil and when hot but not smoking, add the spinach and wilt for about 60 seconds. Remove from the heat and let cool. Step 2: In a medium mixing bowl, add the artichoke hearts, water chestnuts, carrot, red onion, sour cream, mayonnaise, Parmesan cheese, parsley, lemon juice, salt and pepper. Mix well to blend. Step 3: Now that the spinach has cooled, use your hands to gently squeeze out the liquid from the spinach. Roughly chop the spinach and add to the sour-cream mixture. Mix well to incorporate. Adjust the seasoning as needed. Former chef and now Menlo Park stay-at-home mom, Andrea Potischman blogs at Simmer and Sauce; photos and text used with permission.